Camila is one of our Student Ambasadors here at EC Toronto and is one of the most confident and outgoing students I have met. When I spoke to her about her experience during her first few days as a new student at EC Toronto I was surprised. She talked about being nervous in a new city and about making new friends and fitting in. This conversation was great because it reminded me that ALL new students go through the same adjustment experience, even the ones who appear confident and outgoing! I asked Camila to share her story on our blog so that other students can be comforted by her experience. Elizabeth, Operations Manager, EC Toronto I remember perfectly my first day at EC Toronto. I was excited, but nervous at the same time. When I arrived at my class I saw many girls, the boys were absent, and I imagined they were a group of good friends. It seemed to me as if they had known each other forever because they looked so close and at that moment I asked myself if one day I could belong to that group and when would that happen. Time kept going and it was lunch time, I remember that I was so worried about with whom I was going to have lunch! haha. And then here comes a Latin girl and asked me if i would like to have lunch with her!! and obviously I said yes. The name of this girl is Ana Carolina and we’ve become good friends and we even hang out together. 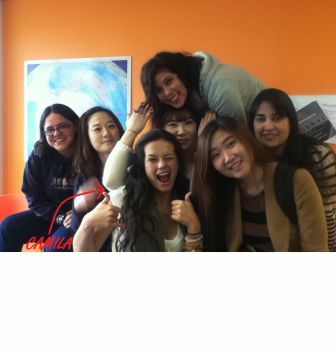 About my classmates, I became really close to them in less time than I expected. What I’d like to say is that at EC Toronto everyone is looking for new friends and they are very welcoming and also kind to everyone, specially to the new students. That’s why is easy to make friends. As there are people from all over the world, all the students are able to find a group, which fits with their personalities.